Credenhill offers a range of instruments for vein surgery from the phlebectomy hooks and pin strippers designed by Dr Oesch to the phlebectomy hooks designed by Dr Mueller. Oesch continues to lead the world with the quality and design of its instruments for the vascular surgeon. Credenhill distributes. Oesch Phlebectomy Hooks Available in sets of three different sized instruments – large, standard and small – or individually, these high quality hooks are resistant to rigorous handling in general surgery and yet still fine enough to permit phlebectomies through incisions of less than 1 millimetre. Left handed instruments can be supplied as a special order. Oesch pin strippers Available in sets of three instruments – Stripper Parva 300 mm, Stripper Magna 520 mm and Stripper Retriever 520 mm – or individually and can be used in conjunction with the phlebectomy hooks. 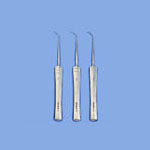 Mueller Phlebectomy Hooks The Mueller phlebectomy Hooks are available in four different sized instruments, small, medium, large and extra large and are designed to remove veins through small incisions on the leg. Left handed instruments can be supplied as a special order. Boazul Cuffs The Boazul roll-on cuff is a complete system creating and maintaining a bloodless field in extremities during orthopaedic, vein, leg and arm surgery. The cuffs, made of natural rubber, are efficient, simple and safe to use without the use of electricity or compressed air.